While begging for the IMF to give his government millions of handouts, Zambian dictator Edgar Lungu has continues lashing out and insulting the same people he is begging from. On Friday, Lungu said Zambia is not a ‘Cinderella Republic’ where anyone can come and speak as they wish and meddle in the affairs of the country in a bullish manner. Lungu warned that external forces will continue to try to ‘bully’ Zambia if the country remains dependent on handouts from outsiders. It isn’t? The PF President observed that over-dependency on handouts led to oppression and that was the reason some foreigners thought they owned Zambia and wanted to dictate the running of the country’s affairs. Speaking to journalists after concluding a tour of the Kala Marine Barracks in Kawambwa yesterday, Lungu challenged Zambians to be self-reliant and to fully utilise the natural resources the country was endowed with. “Why should we be importing vegetables? Why should we be looking elsewhere? We can generate wealth within our territory. No one will respect us if we become economically dependent on outsiders. But it his regime that borrows money and depends on foreigners. “That’s why they also want to transgress into our political arena and begin telling us what to do. You are free politically, but economically if you are not free; you are not a free person,” Lungu admitted. He likened that to a home scenario where a neighbour wanted to meddle into a couple’s marital disputes just, because he paid rentals for them. If you pay couple’s rent, certainly you earn the right to intervene when they engage in irresponsible conduct. Lungu said Zambia was a sovereign State and thus he did not want anyone to undermine that, as was the case in other African countries. A sovereign broke country? “People think that they can bully us because our economy is weak, so let’s strengthen our economy. Politically, we are very strong, but economically, we are weak. So because we are weak they think they can twist us,” he said. He added; “But what am seeing now is that people think that Zambia is a Cinderella Republic, where they can come and try to push us in the corner and try to tell us, ‘no, arrest that one, no release that one. We will not do that, but we are going to strive to retain our Independence politically and economically,” Lungu said. Lungu stated that first Republican President Kenneth Kaunda and his friends did not liberate Zambia in vain as they wanted the country to be free from external influence and oppression. ZWD comment: This is gibberish talk from a lunatic. We have heard this kind of nonsense before from dictators before. There is nothing new Lungu can say that other dictators have not said about donors. A lot of Zambians are actually happy to have international partners intervene in Zambia’s problems. 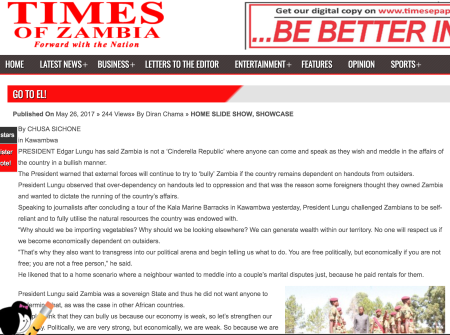 Lungu himself knows this and as he admits herein, Zambia depends on other countries so Lungu will not succeed in misleading public. Just a a few months ago, he wanted Zambia to withdraw from the International Criminal court so that he numerous crimes against humanity can die a natural death. But behold and lo, even his own cadres rejected the plot, confirming once more that Lungu is headed for the ICC. Lungu can pretend as he wishes, but deep down he knows that the bells are tolling and his days have been weighed and found wanting. Its just a matter of time. Lungu is not Mugabe and can not do what Mugabe has managed to do. We mentioned here last week that the international wheel of justice has been put in motion against Lungu. It could be slow, but it is turning, slowly but surely. What Lungu does not know is that even those he thinks are his most trusted aides are actually now collaborating with international forces. Wait and see.